I have another confession to make. First, when I started my #montessorihousechallenge, I was very focused on my children’s belongings, their tidy up habits, their independence skills. You see, since becoming a mother, I have focused most of my attention towards my children. Meanwhile I have developed skills and a business related to parenting and children. So I have always observed children; how do they play, can they tidy up, can they do this independently. If you go to my blog post here, you will read that I was failing at this task for around 18 months, mainly because we moved from London where I had a good network of friends and support to the countryside and also because I went back to work full time (well school times hours but the kind of job that I was committed to and I was bringing a lot of work at home). While going through each area, as planned in the challenge, I started to face the ugly truth. Most of the clutter/belongings/objects were mine and were preventing me to organize my house to suit my children’s needs. Note that I have always been aware that I’m a “hoarder” and worst, an unorganized “hoarder”. I could go in a deep analysis to explain why I’m that way and why I was not tackling the issue but it’s not the object of this blog post. Let’s say that I have finally seen the light and faced the truth. I suppose I was ready (to make it short, let say that these past two years, I have worked on many issues and I have now a clear mind-set of what I want in life and it’s not the clutter). Now you might be surprised that a Montessori teacher is a hoarder. I admit that even me, I was under the impression that most Montessori teachers must be very orderly, organised and borderline OCD. I thought I was an exception. However, I have noticed over the years that many parents (and potentially teachers) are attracted to the Montessori education to teach the opposite of what they are to their children. Maybe also because they want to overcome their own issues and deep down, crave order and organisation. It was totally my case and since I have explained this a bit on my Facebook page, many parents have come forward, admitting the same difficulties. Sometimes, parents also become a hoarder after having the kids. 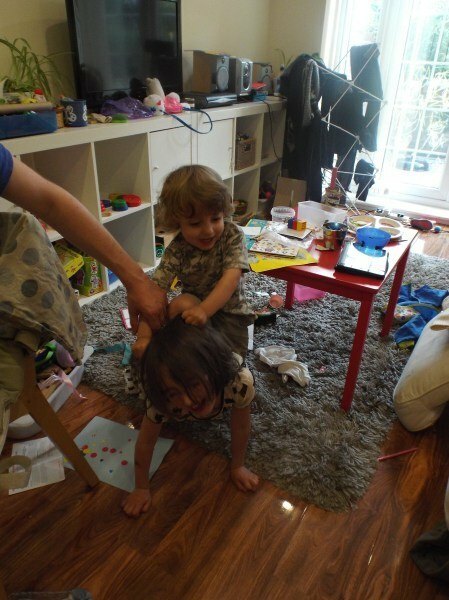 Let’s admit it, children bring lots of joy but also lots of chaos! How do we control the amount of toys, clothes, kitchenware, babyware that come with having children? No everybody is a born minimalist so it’s very common to be drawn in an incredible amount of objects after having kids. Also a classroom is not a home environment. When I worked in a school, it was easy to organise and keep everything in order because it’s only the Montessori space and none of my personal belongings. Well while I was in the middle of decluttering my children’s toys in January, somebody mentioned to me the KonMari Method. I checked the lady and her books and decided it was not for me as she wasn’t a mum (well in fact she is now, but she was not when she wrote her books and she didn’t explain much about children in her books). In the end, I finally gave the method a go and let me tell you that it has already changed my life. And my children’s life too. I’m documenting this process and especially I will show you how I make some decisions regarding my children’s belongings based on the Montessori principles. As Marie Kondo doesn’t give any tips about what kind of toys to keep. This is the area that I feel able to make a judgment based on the Montessori principles. I help parents on a regular basis to design their children’s play space at home, I also help homeschooling families. Just before I started my KonMari process, I was reflecting on this service as I have noticed that families who are quite organized for their own belongings are well able to tackle the changes that I suggest for their children. However, some families had great difficulties making changes and those families had many belongings and clutter. Let’s say that I am now sure that even if many parents will come to Montessori first for their children, at some point, the Montessori education could help them to realise that their own life is full of clutter and until they declutter their own belongings (and life and parenting, but more on this in another post), focusing on the children only might be pointless and counterproductive. It’s a least what I felt and observed in my own house. So I urge you if you have started the Montessori house challenge and you’re feeling overwhelmed to have a go at decluttering your own belongings first. Follow my progress here and on FB and comment down below about your journey! where to buy Montessori toys and Montessori material in the UK?